Grass seed has the best success rate if it's dispersed when the weather is still cool, but not cold. Temperature extremes will kill the seed off before it gets a chance to germinate. Create a green, lush lawn by sowing seed in the spring or fall. Plant grass seed in April, if possible. If you experience an early warm up, plant in March. May also is acceptable for planting. The goal is to promote growth before the heat arrives so the roots can develop. Cool-season grasses also can be planted between August 15 and September 15. Take the soil temperature. 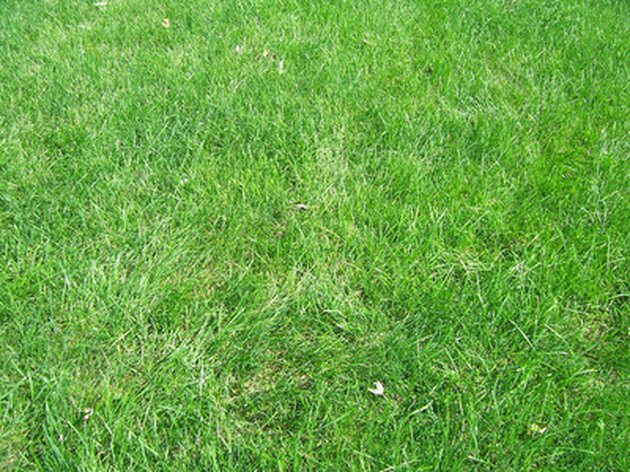 Cool-season grass grows best when planted in a temperature of 50 to 65 degrees Fahrenheit. Warm-season grass seed needs temperatures between 65 and 70 Fahrenheit. In a northern states, sow the seed no later than 90 days before the first frost is expected. In southern states, that date can be pushed to 60 days before the first frost. Grass seed can be planted close to wintertime, but it may not have enough time to sprout before the cold weather sets in. Instead, it will stay dormant, and then sprout during the spring. Snow and wind may move the seeds, creating a sparse lawn next year.